By setting your sights keenly on the fan experience, you will create a catalyst for driving even better data. And better data is — you guessed it — the critical fuel necessary for building even better fan experiences. Imagine the potential of a killer fan experience that will engage your fans in such incredible ways that they will organically deliver rich personal data. More and better data drives greater fan experiences, which drive more sponsorship investment and better brand activation, which make for better events for your fans. Which leads to better, more personalized data. And from there? Greater revenue from fans and sponsorships. 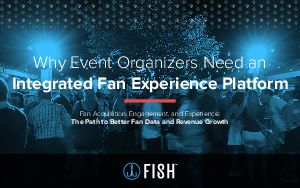 FISH Technologies is the Integrated Fan Experience Platform that leverages implicit and explicit real-time data and analytics from every point of the event cycle, to improve the attendee’s on-site experience and deliver more benefit to the sponsor. The result is an event that’s more engaging, more experiential, more measurable, and more profitable.